Oolong tea, also known as Wulong, is a unique type of tea native to China and Taiwan. Oolong is a product of skillful craftsmanship from dedicated farmers to create a tea that is loved not only in its native countries but also in other parts of the world. 2.1 What Makes Oolong Tea Different? 5 What is the Difference Between Loose Leaf and Tea Bag Oolong? 8.1 Is Oolong Tea Good for You? There are many different stories in China about how the tea came to be. One story claims the tea’s ‘black dragon’ name comes from the large dark leaves of different shapes resembling a dark, fierce dragon. A different story claims that a Chinese farmer by the name of Wu Liang accidentally found the tea. Wu Liang picked his tea leaves and left them to dry. Upon returning to his harvest, he discovered oxidation had withered and darkened the tea leaves. According to legend, Wu Liang became Wulong, and the rest is history. Regardless of which story resonates with you most; the fact is that oolong tea is native to the cool rocky highlands of China where conditions for growing tea are not exactly ideal. It is these tough conditions that gives oolong its unique tastes and flavors, unlike teas that are grown in more ideal circumstances. Both Taiwan and China produce a variety of different oolongs, again partly due to the different environments in which it is grown, but also in the manner in which the oolong is produced. How and when the tea is picked also plays an important role; some are harvested in the spring and have that fresh, springy taste. Others are picked during the winter months and come with a more mature roasted taste. Today, there are different types of oolong teas being cultivated in many far-flung corners of the world, from Australia, Nepal, New Zealand, India, Vietnam, and other parts of Asia. What Makes Oolong Tea Different? While it is true that black and green tea may be the most common types of tea across the globe, oolong tea is sometimes thought of as the little-known treasure of the tea world. Oolong cannot be fully categorized into either green or black. Instead, it falls somewhere in-between. Depending on the level of oxidation and how it is processed, oolong can lean towards either the black or the green tea, in flavor, texture and trait. The number one difference between oolong tea and other kinds of tea is in the levels of oxidation. This is what gives the tea its unique aroma and flavors, plus all the other benefits. Green tea undergoes hardly any oxidation at all, and this is why it retains its green color and flavor. Black tea is put through a more thorough oxidation procedure, which gives the tea its dark hue. The oolong oxidation process differs from one oolong tea to another. Some variations some may have as little as 8% oxidation, while others have as much as 80%. The level of oxidation affects the taste and color of the tea. The least oxidized oolong is greener, while the more oxidized will have a darker color and stronger flavor. Along with color and aroma, the appearance of the oolong tea helps us distinguish the type. Depending on the production process, it can be rolled into balls, curled to different shapes, or even rolled into a thin strand. Even though one batch of harvests may have been oxidized the same way, it is possible for the producer to change the taste through the rolling process. The shape of the oolong leaf is also a major influence in the flavor of the tea. While still not as widespread in the West as in its Asian homeland, oolong is gradually becoming a tea with a truly global appeal. Countries as far apart as Africa, Nepal, New Zealand, Australia, India, Thailand and further remote corners of Southeast Asia have turned to the cultivation of their very own oolong varieties. It can be just as pleasant and enjoyable as the more well known and much-loved Chinese and Taiwanese oolongs. The birthplace of oolong tea. There are many reasons why Chinese oolong is so different from the Taiwanese variations of the tea. Color and taste being just two. Generally speaking, Chinese oolong is oxidized much longer than its counterpart in Taiwan. It gives the Chinese oolong tea its darker in appearance. Some tea fans consider to be a less dry, but more mature taste. Some of the choicest and most popular oolong teas come from the Chinese province of Fujian, a very rocky and almost inaccessible place. This is the home of the Yancha tea, better known as Wuyi or cliff tea. As a matter of fact, it takes its name from the unwelcoming environment. Yet, it is this very terrain that gives their oolong its unique taste and body. Discovered in the 18th century in Fujian province, monkey picked derives its name from a folk tale which claims that monkeys native to the mountainous region were trained by local monks to pick the tea from the highest branches. The term later evolved to mean tea of the very highest quality. Monkey picked teas are considered to be among the most authentic oolong teas. They are still produced on a small scale and are prepared by traditional family tea handlers. The most popular monkey picked tea is the Tie Guan Yin which is also among the rarest oolongs in the world. From the mainland comes another famous oolong, the Tie Guan Yin. For those coffee fans who would love to start drinking tea, the Tie Guan Yin is an excellent choice. Initially from Anxi County in Fujian, this smooth and mellow tea with a shimmering, golden tint, is said to be ideal for people who would like to make the transition from coffee to tea. Tie Guan Yin is made from the tree which also produces the popular Qingxin oolong. Qinxin has a slightly more modest flavor, but in the hands of a skilled tea master, can still deliver a wonderful tea experience. The tea is rolled into balls before it enters the oxidation process. From the Phoenix Mountains comes the Phoenix Select, which in China is better known as Fenghuang Dancong tea. These tea plants grow so tall they require ladders to be picked. This tea also has a unique brown color from the oxidized leaves and can be a bit dry and bitter. However, after repeated infusions, the tea achieves a remarkable texture which is far less dry and has interesting woody tones to it. Other famous oolongs from this region include: Da Hong Pao, Shuixian, and Xiao Hong Pao. Each of these teas has their own authentic taste and color. As a rule of thumb, teas from Fujian have flowery and fruity notes and are well matured, which makes the teas popular with both locals and people all around the world. The “Da Hong Pao” tea is considered the most difficult to cultivate as it comes from a rare tea tree which produces only small amounts of tea every year. For this reason, it may be more expensive to purchase. Taiwan has emerged from the shadows of Chinese oolong to establish itself as an authentic oolong tea producer in its own right. Some tea experts claim that there are still traces of the original Taiwanese oolong dating as far back as three centuries. Oolong may have been first discovered in China, but Taiwan also has its own oolong traditions. Less oxidized than the Chinese version, Taiwanese oolong tea is greener than the darker Chinese variant. Taiwan’s current oolong is generally imported from China, specifically from the Fujian area. Just like in China, the most popular type of tea is Wuyi. But the Taiwan version, grown in the central country regions, differs dramatically in terms of color and flavor to its Chinese cousin. The Taiwanese have developed their own original methods for processing oolong tea. Over the years, these methods have changed to meet the domestic demand for a greater variety of tea. Currently, there are more than 100 types of tea being enjoyed both within the country and beyond its borders. Some of the more popular Taiwanese oolong varieties, commonly known as Formosa tea, include Shan Lin Xi High Mountain oolong, the Taiwan Milk oolong, and the Dong Ding oolong tea. From the central region of Nantou comes the delicious Dong Ding oolong type. Dong Ding, also spelled Tung-ting, uses a processed Chinese oolong plants from the Wuyi Mountains. It uses a unique style in order to achieve oxidation of up to 30%. This produces a sweet, smooth and average bodied tea. The oxidation levels are just right to allow the tea to maintain the green hue that makes the Jade oolong. A Taiwanese tea with a milky taste ideal for anyone who prefers a creamy feel to their tea. Jin Xuan tea, a.k.a milk oolong tea, is light and extremely smooth in texture. Despite its name, milk oolong variants do not mean that it should be enjoyed with milk. The title ‘milk oolong’ comes from the tea’s floral aroma and its milky sweet taste. Milk oolong has gained popularity as one of the most delicious oolong teas thanks to its light yet flavorful taste. It should come as no surprise that the best oolongs are grown in harsh, mountainous regions. The location of the plant plays a crucial role in producing the unique of flavor the tea acquires after oxidation. The best creamy teas benefit from the environmental conditions of their surroundings to fully develop their aromas and flavors. The Oriental Beauty (Dongfang Meiren) oolong tea is native to Taiwan and is considered by many to be the best of the authentic Taiwanese teas. This variation is oxidized up to 70%, unusual for the Taiwanese tea culture. This oolong tea is popular with sweet-toothed Europeans who like flavorful teas. Taiwan also has a version of Tieguanyin tea that it is flavored with osmanthus flowers for a sweeter taste. This tea is not as oxidized as the Chinese variant, but it is just as good. In recent years, however, many of Taiwan’s tea producers have been turning to coffee production. Thus, Tie Guan Yin is becoming increasingly rare. Taiwan’s largest tea production region is in the North, and it is here that the Wenshan Pouchong is found; an oolong with leaves of a twisted shape which undergoes an oxidation process of about 15%. Other quality Taiwanese teas come from the high mountain regions of Shanlinxi and Shan. These oolongs have fully developed flavors, great aromas, and a pleasant aftertaste that tea lovers the world over have learned to appreciate. For centuries, tea has played a significant role in the Vietnamese culture. And it’s no wonder. The climate in Vietnam is ideal for cultivating tea, and the country has excelled as a producer for both domestic and international consumption. In fact, if it hadn’t been for Vietnam’s tragic history of armed conflict, the country would today be one of the major tea produces in the world. Thankfully, this situation has now changed, and Vietnam is well on its way to becoming a major player in the global tea industry. One of the most famous Vietnamese oolongs is the curly-leafed, dark green Imperial oolong tea variant. Once infused, this tea turns light green, a tell-tale sign of low oxidation levels, and produces a tea with the soft and sweet nuances of honey. As with other oolong tea types, the Vietnamese oolong uses the larger leaves of the plant, unlike other teas that focus solely on the bud. Vietnamese oolong traditionally relies on its century-old craftsmanship to create a host of high-quality teas. For more oolong tea types, please visit this post. The list contains my personal choices. There are many different places where you can buy different types of Oolong tea. The Bigelow Company is known for its high-quality teas in general, and their oolong tea variants do not disappoint. Bigelow’s oolongs are smooth and sweet and perfect for any time of the day or night. An excellent conclusion to dinner with friends and family, oolongs from Bigelow are sure to receive an abundance of appreciative compliments. Bigelow’s tea is carefully crafted to fully develop all the authentic flavors and aromas that you’d expect in oolong tea. Enjoy your oolong tea whichever way you like, whether piping hot or iced, in the morning or evening. You can even add some cream for a little extra comfort during the cold months. The smoothness of the Bigelow oolong tea will have you hooked for a long time to come. Prince of Peace oolong is sourced right from the homeland of oolong in Fujian province. Traditionally picked and processed to deliver the pleasant taste of this flavorful, golden Chinese oolong. A tea you can enjoy wherever you happen to be in the world. From the southern parts of the Fujian Province comes the Foojoy China oolong. The mountain region ensures the tea contains all the beautiful aromas that make a good quality oolong tea. Foojoy is processed traditionally, undergoing partial fermentation which helps bring out the flavors and color with every single brew. Foojoy oolong tea is sweet and tasty and will definitely leave you asking for more. This global tea company brings you the best of oolong teas, perfectly oxidized to ensure all the authentic flavors are retained. Oolongs from Twinings undergo a process of repeated rolling to achieve the desired dark green color. A pleasant and calming tea, with sweet floral aroma and exquisite flavor, bursting with the countless health in each and every cup. What is the Difference Between Loose Leaf and Tea Bag Oolong? The discussion on which is better, the loose leaf or tea bag oolong is a never-ending. Everyone has a preferred option, and none of the options are better or worse than the other. Basically, loose leaf oolong tea contains dried, partially oxidized leaves that are close to their original, raw state. Bags contain portions of ground tea, which some people prefer simply for the convenience. A lot of serious tea lovers prefer the loose leaf teas for the sheer authenticity. They insist that loose tea has more flavor as well. Tea bags can be subject to mixing with other teas, and as the tea in bags is so finely ground, flavors can sometimes seem less robust than loose leaf. Some oils that contribute to the aroma and flavors of the tea can also be lost. Making a pot of oolong using the loose leaf tea can be beneficial regarding flavors. As the leaves come into contact with the hot water they open up releasing all the flavors that were once trapped inside. However, some high-quality oolong tea bags can also provide maximum flavor and aroma enjoyment. Tea bags allow us to prepare a cup of tea much faster than the loose leaf, and are a perfect solution for when there’s not enough time to enjoy the whole brewing process. Bags or loose is a personal choice. In either case, it is the quality of the tea that can make or break your tea drinking experience. Boil a kettle of water then let it cool to about 85 to 95 degrees C.
Add one heaped teaspoon of loose leaf or one tea bag into a mug or cup. One teaspoon or teabag per person, and an extra one if you’re making the tea in a teapot. Add the boiled water directly onto the tea. Stir the tea, and then allow it to steep for 1 to 4 minutes. Stir again at the halfway point. When ready, remove the tea bags or strain the tea. Enjoy a delicious and refreshing cup of oolong tea. Remember, tea is a very personal thing. You can make your own adjustments in time and amounts until you find the perfect tea for your preferred taste. Click here to find a more detailed guide on how best to make, steep and brew oolong tea, including iced and milk oolong tea. Generally, the caffeine content in oolong is low, but it changes with how you brew your tea. Factors such as temperature and how long you steep the tea per brewing will gradually increase the caffeine content. On average, brewing can take up to five minutes if you prefer your tea strong, which means that the caffeine content can rise. If you’d prefer to keep the caffeine level low, it’s best not to brew your oolong for longer than two minutes. Some of the common side effects of consuming a lot of caffeine include being nauseous, irritable, a lack of sleep and palpitations. Caffeine in large amounts over a short period of time can result in headaches, a loss of appetite, and in extreme cases can cause vomiting. Vomiting and diarrhea together are a sign of caffeine poisoning and you should seek out a medical professional immediately. Caffeine can be found in almost every kind of beverage, from tea, coffee, soft beverages, and energy drinks. If you are sensitive to caffeine to such the extent that you are physically affected, you should be wary of all of the above beverages, including oolong tea. Also, consuming caffeine before bedtime could cause you to have a sleepless night. Some medications may cause a negative reaction when used with oolong. That is why before starting to take oolong tea, you should talk to your physician to check the tea will not affect you in any way. This is especially important if you are taking antibiotics, heart medication, certain types of sedatives, anti- depressors, aspirin, pills for contraception, cancer treatment and/or medication for high blood pressure. Just as with anything that is new to your diet, you should consult a healthcare professional if you are in doubt about an existing health condition before you introduce oolong tea into your daily diet regime. The health benefits of oolong tea are many and varied. As we have learned, the traditional Oolong tea is balanced in between green and black teas. As such, it brings the traits of both these teas, plus qualities all of its own. For example, oolong tea contains powerful polyphenols, the antioxidants that fight free radicals. Free radicals are harmful atoms that cause damage to human cells. The regular consumption of oolong tea can improve cognitive performance, reduce anxiety, create stronger, healthier bones, and lower the risk of heart disease. Is Oolong Tea Good for You? For millennia, tea has been known to be the source of a whole range of health benefits, and oolong tea is no exception. Whether it’s to help with eczema or prevent heart disease, oolong tea has a huge following of fans who swear by medicinal qualities. But those aren’t the only benefits of this delicious tea: drinking oolong for losing weight is a particularly popular claim that has all the science to support it. A lot of the properties of oolong tea are partly due to the presence of catechins, a special type of flavonoid. The number of benefits contributed to these flavonoids isn’t exactly small. Oolong tea is associated with lowering the risk of cancer, obesity and heart disease. It has been shown to help in the prevention of diabetes, to create stronger, healthier bones, reduce both oxidative and inflammatory stress. In addiction, it is believed to promote an increase in our cognitive functions. And no, we’re not making this up. 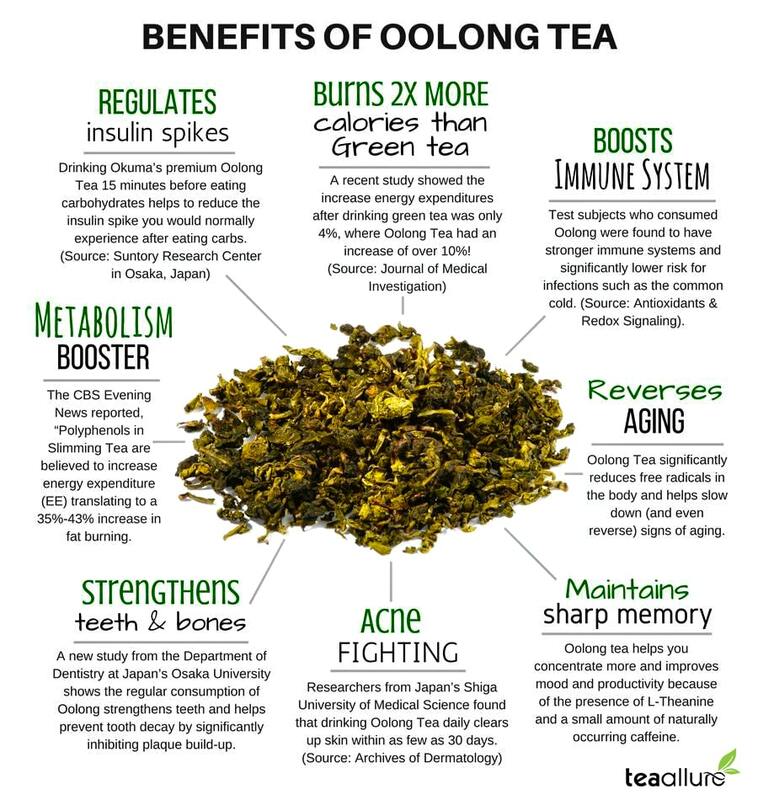 Besides these awesome health benefits, oolong tea has gained a reputation as one of the best teas to aid with weight loss. The caffeine and polyphenol percentage in an average cup of oolong are almost the same as that in green tea. Polyphenols are one of the main reasons why a lot of people consume green and oolong teas, since they are potent antioxidants and help to fight the so-called free radicals that may harm body cells. However, we are all different. It is possible, although rare, that you might react to the tea in a less than beneficial way. Especially if you are sensitive to caffeine.